Make Your Very Own DIY Hot Wheels Powered by CO2! - Muscle Cars Zone! Make Your Very Own DIY Hot Wheels Powered by CO2! If you are a type of guys that loves coming up with new toys and inventions on its own, than this video of a man showing us how to make our very own DIY Hot Wheels is the one for you. You are going to need just couple of things and it is easy to do, once you grab the main gist of it. A package of CO2 cartridges had just arrived by the mail and a small block of wood, and this is exactly what inspired this man to do something amazing. 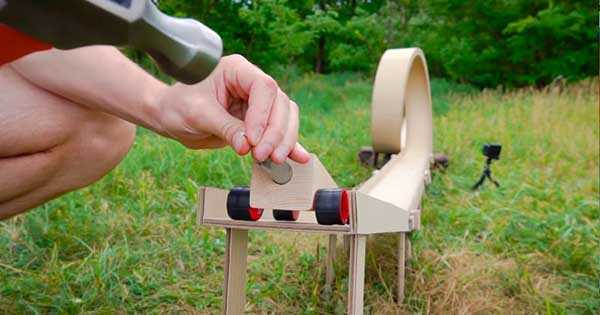 He began putting the DIY Hot Wheels toy together by marking a diagonal line into the middle of the piece of wood. Using a hacksaw he cut it out and used a sand paper to make a clean and smooth finish. Next, he took couple of bottle caps and used hot glue and a bike tire to put the wheels together. It is absolutely easy to build one of those, and you are going to need four. Then make several holes on the piece of wood that you have just cut it out and attach the wheels with a nail. Insert the CO2 cartridge at the back and your car is ready. All you have to do now is to build the track and your DIY Hot Wheels set up is ready. Simply pop the end of the cartridge and watch the mini car shoot itself across the track. What do you think, would you make one? Finally, want a hoverboard? Then DIY!